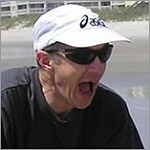 Jim specializes in triathlon coaching Sprint to Ironman and also marathon training. Jim has 15+ years experience coaching triathletes and did his first triathlon in 1987. Full service coaching with unlimited and open communications are the cornerstones of Jim's business. Whether you are local or miles away, email and phone communication are always open. Coach Jim McGehee has a true passion of coaching and teaching triathlon! With 20+ years of triathlon racing experience, 15+ years of coaching experience and a Master's degree in Exercise Physiology you will be hard pressed to find anyone more qualified as your coach. Jim has been a multiple year USAT Age Group Honorable Mention All-American and winner of the 2006 Virginia Triathlon Series Master's division and multiple Age Group series wins. Passion for the sport and for teaching are what Jim is known for! Success. Coach Jim McGehee has been notified of your message.